Electronic consult (e-consult) is a telehealth care delivery mode that supports asynchronous communication between primary care providers and specialists for consulting on patient needs. 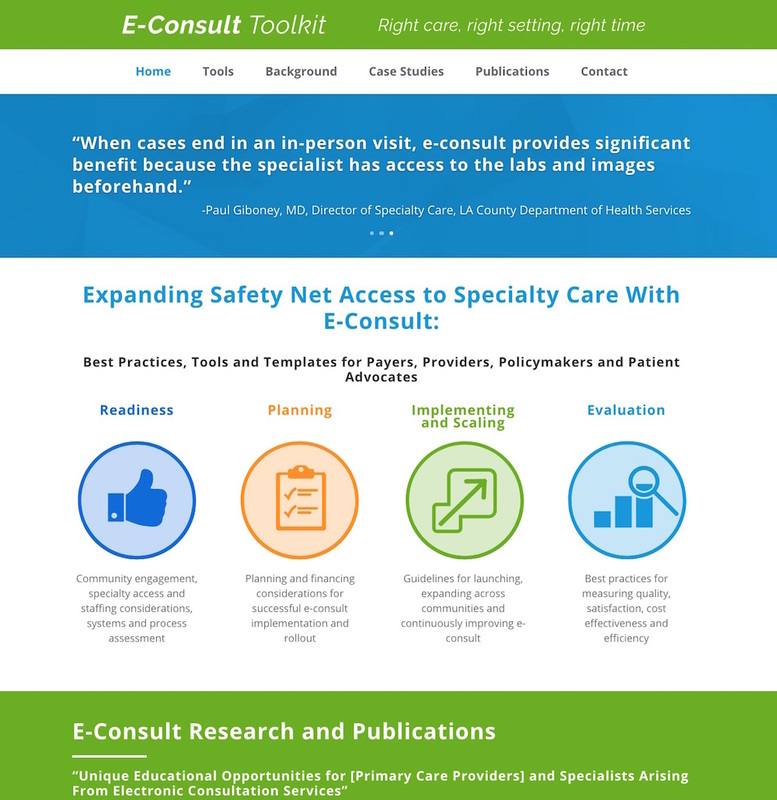 E-consult’s ability to both improve access to and quality of specialty care makes it an effective and efficient tool for California’s safety net. To support safety net provider adoption of e-consult, Blue Shield of California Foundation (BCSF) has awarded $2.9 million in grants to 12 of California’s county health systems. As this grantee cohort has progressed with planning and implementation, a common need technology selection and implementation assistance has surfaced. E-consult is a system-wide, technically complex change in care delivery that requires extensive planning, integration of referral and consult functions with multiple electronic health record (EHR) systems. In addition, reimbursement strategies require demonstration of cost savings and evaluative metrics to demonstrate network and access improvements. Technology workflow analysis and future state mapping, including integration points, phases and depth of integration between solutions. Definition of requirements across technology systems. Gathering of baseline metrics to measure accomplishments downstream once the solution(s) and processes have been established across end-users. Engagement of financial services and revenue cycle teams to leverage how other e-consult/electronic referral pilots have demonstrated cost savings to hospital systems. Creation and leadership of workgroup subcommittees on reimbursement policy, fiscal analysis of e-consult implementations and payers. Implementation of best practices for measurement and evaluation from other e-consult grantees, and determining how to support and participate in PRIME program. Support of community partners to provide greater preventive services with higher value and lower cost. To supplement its hands-on support to BSCF grantees, BluePath also designed and published a toolkit of best practices and tools for readiness assessments, planning, implementation and scale and evaluation of e-consult implementations.